Well not really, I happen to really like Christmas. I love the smell of fresh pine, the taste of a good peppermint candy cane, the glittering lights, the fine dusting of snow, warm mugs of hot chocolate and the brightly wrapped Christmas presents. I'm also one of those weird people who ADORES gift giving (more on that soon). Christmas is a close runner-up to my all time favorite holiday: Halloween. This year I decided to combine both favorites into one. How? Easy. 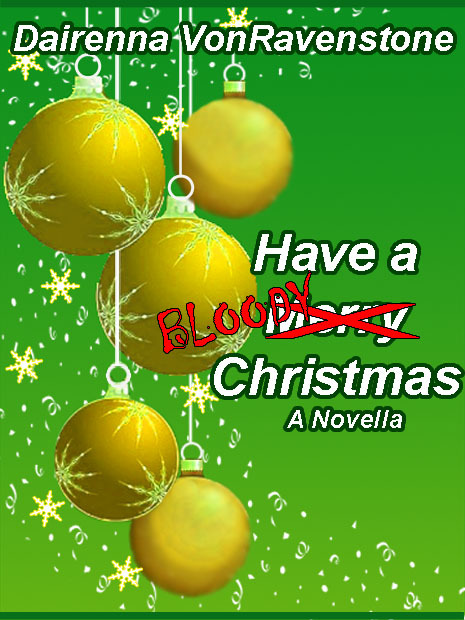 I wrote a Christmas themed horror novella entitled Have a Bloody Christmas. By all rights it was SUPPOSED to be out on the 20th but life got in my way. I've also been completely and utterly unmotivated since National Novel Writing Month (NaNoWriMo) ended on Nov. 30th. Actually, I think the proper term I'm looking for is "burnt-out". After winning NaNo 2011 with 175,000 words (about 300 pages single spaced, 12pt font in Word), who can blame me? 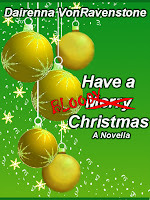 Anyway, Have a Bloody Christmas is out now and available for download here for FREE. Yes, absolutely FREE. Like I said, I enjoy giving gifts during Christmas and this is my gift to anyone reading this. It will be a gift for all time as I doubt I'll be adding a price tag to it anytime soon. A comment that really stuck out for me about the novella: "It reminds me of the kind of senseless violence in horror movies like ‘The Strangers’." Why thank you Vicky. 1) A forth anthology will be coming out by the end of THIS year. It will be a mixed themed anthology called Hodgepodge...which means "jumbled" and this IS a jumbled theme anthology so it works. 2) I'm (slowly) making changes to the website and by the New Year it will be a bit more concise. 3) I'll be writing a blog about my NaNo experience with some advice for those thinking about self-publishing. 4) Sometime in 2012 a fifth anthology will be released called Fairy Tales Gone Wrong. Spoofs of the classics will include: Little Red Riding hood, Snow White, Sleeping Beauty, The Little Mermaid, Goldilocks, Rapunzel, and a Brave Knight vs. Dragon tale. 5) I'm participating in "twelvella" or "12in12". This is basically NaNo on steroids and the goal is to write a novella a month. A novella is defined as a piece of fiction 20,000-40,000 words in length. So, by the end of NaNo 2012, my goal is to have written 240,000-480,000 words with 50,000 of those words in November. Technically I've all ready started and the Rapunzel spoof, Sleeping Beauty spoof and another short story will be used towards my goal of 20K-40K words for this month. After those three, I'll finish off the spoof anthology then I'm investing in a dart board. Once I get titles for all my ideas, I'll stick the titles to the dart board then start flinging around sharp pointy objects to see what I'll be working on the rest of the year. More on this in an upcoming blog. Until then: Merry Christmas (or Happy Holidays for those that don't celebrate Christmas) and have a Happy New Year.